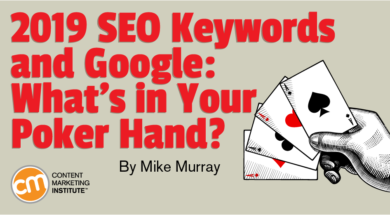 2019 SEO Keywords and Google: What’s in Your Poker Hand? Strap in tight. 2019 will be a rough ride for keyword rankings and SEO professionals will feel the squeeze each time Google downplays traditional search engine results. Google already promotes no-click search results, often providing answers without the need to click for more details. The no-click (also known as zero click) searches will remain a factor for marketers. Referencing data from Jumpshot, Rand Fishkin of SparkToro last year found that 61.5% of Google mobile searches are no-click (34.3% with desktop searches). Additionally, voice search will have an impact, especially with smart speaker products like Google Home and Amazon Echo. Econsultancy does a good job sorting through voice search projection interpretations. If your natural search engine traffic took a hit last year, expect more of the same unless you take steps to recover from traffic dips. Even if you’re fine now, you might want to reinforce your footing. Picture a virtual table with thousands of people playing at the same time in scores of places. In this game, instead of collecting winnings from your fellow players, you’re seeking Google rewards. With each of your “keyword” hands, Google snickers at what you’re holding or rewards you with the top positions among the search engine results pages (SERPs). When you target another keyword phrase, you’re dealt a new set of cards. Unlike real poker, this hand is not random. You end up with cards based on what you bring to the table. What are your SEO strengths that will give you a good hand? Rather than list all of the ranking factors, I’ll cite a few that should shape your keyword choices. Based principally on backlinks, your score will influence your rankings. Moz tracks the data, and websites fall somewhere between 1 and 100. Do you even know how your site scores? Higher scores increase the odds of higher rankings. Websites with some pages (like maybe 10 or 20) won’t fare as well as websites with hundreds or thousands of pages, which signal to search engines that they’re serious players. More pages make it easier for websites to play up key themes, attract backlinks, and add additional pages to target coveted keyword phrases. Online marketers debate its value toward your rankings. My sense is that its importance has waned, but it’s clearly a factor. If your domain includes part of your keyword phrase, you have an edge. Content headers: Do you use H1 tags with the text? SEO page titles: Can you customize them on a per-page basis? Page URLs: Can you keep them short and use dashes to separate words? To underscore the possibilities for 2019, I identified three companies through LinkedIn to see how well they’re already doing with SEO and to show ways we can learn from their efforts (good or bad). Taboola is probably in the best shape with a domain authority of 72 (Jellyvision is 43 and Catalant is 36). Although Taboola has first-page rankings on Google, several keywords aren’t hitting the mark and the best ones could do better. For example, Taboola might avoid going after both “native content” and “native advertising” on the same page. “Native content” ranks No. 11 with 590 searches, but “native advertising” is No. 12 with 5,400 monthly searches. 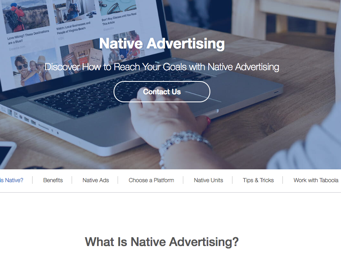 Both phrases rank well, but “native advertising” may not get much higher with “native content” having a strong presence. Fortunately, Taboola used an H1 tag with “native advertising,” but it’s possible that phrase is on the page too many times (sorry, there isn’t a foolproof formula). With the high search volume, it might be worth tinkering with the text and the number of keyword references over a couple months. As for “native content,” Taboola may want to use that on another page or create a new page. Adding content is always a good approach to support a target keyword phrase. Jellyvision should seriously consider that option. The business only has a few good rankings for low-volume keyword phrases. I’m actually a fan of keywords that aren’t searched often. They can yield good prospects for sales to help the bottom line. But more pages are needed. The website has a strong collection of content. Jellyvision understands how businesses can convey critical information to employees. But that content often doesn’t relate to relevant keyword phrases. Sometimes its content keywords aren’t searched at all. One of its content headers and SEO page titles is: Why Understanding the Four Major Learning Styles Will Help You Reach More Employees This Open Enrollment. The highest ranking for that page is 23rd for the phrase “benefits of learning styles” (30 monthly searches), which appears on the third page of Google. Maybe it’s good content – just not an effective string of words for SEO. One of their best rankings is “extra space storage” – No. 14 with 135,000 monthly searches on Google. But it’s for a case study featuring a client. 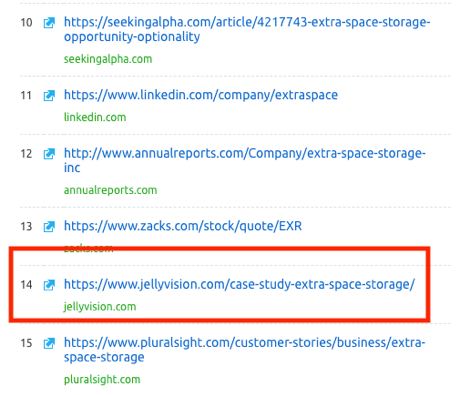 I doubt that website traffic helps much with conversions because people searching for “extra storage space” won’t find anything meaningful to them on this page. Catalant struggles with SEO – at least with its apparent target keyword phrases. For starters, it is centered on a narrow topic – focusing on agility to connect with the right talent. The company has accolades from Forbes, Entrepreneur, and Financial Times. However, Catalant’s site can’t seem to rank well for words it cares about. If you can’t rank in your niche, you have a problem. Sometimes it’s useful to branch out and look for related keyword phrases that are relevant but not as competitive. Catalant still has some hope. It could revise SEO page titles (even doing that can make a difference) and add new pages with keyword-focused content headers, short URLs, and effective SEO page titles. Beyond these companies, some marketers will win out if they can qualify for a featured snippet that appears after the paid ads on Google. They’re not easy to get. You can potentially land some by providing good explanations about a topic. Content built around questions can help (you don’t necessarily need a Q&A format). Although there are no formal requirements to improve your odds, some marketers suggest including details in tables, lists, and numbered steps. Keep in mind that many featured snippets are for keyword phrases with low volume. Oddly, websites that struggle to rank for many keywords sometimes earn a featured snippet. Just like other search results, featured snippets come and go. You won’t always be the winner and you can quickly get one back after losing it. Stone Temple Consulting in 2018 explored the volatility and other trends around featured snippets. In 2017, Ahrefs released a study saying featured snippets appear in 12.29% of results. Again, keep in mind that Google continues to alter SERPs with its Answer Box, People Also Ask, tweets, Image Pack, and more. Your rankings also will often change based on geography when Google introduces different results based on the most relevant searches. Not all content will have SEO implications. You still produce videos, infographics, white papers, and blog posts to reinforce your status in an industry while supporting social media, e-mail, and other marketing efforts. However, if you’re counting on SEO to drive traffic, I wouldn’t recommend producing less content. You might say, “Isn’t quality what matters most?” Of course, quality is important. But I wouldn’t scale back content that could be used for SEO. Your best bet is to tailor new content to keywords that can rank. If you can get your keyword phrase in the bulk of the page header, you’re golden. But here’s the deal: Do you even deserve high rankings? I’m all about what I call the SEO keyword “sweet spot.” But you have no business going after keyword phrases searched 1,000 times a month when you can’t even manage to rank on the first page of Google for keywords people search for 50 times. Remember, SEO is a poker game and it’s all about what gives you an advantage. Look at your keywords and see how many are on the first page of Google. What’s the average search volume? You’ll get a sense of your sweet spot – defined by top rankings and search volume. With your SEO strategy, you can be a little aggressive. If your average search volume sweet spot is 100, maybe target keywords searched 200 times a month. Why? You can assume your current SEO efforts had fallen short – the wrong combination of keywords in page headers, SEO page titles, etc. In a few cases, see what happens if you make more risky changes. I’m working with a website that wasn’t even in the top 100 positions for many of its 20 strategic keywords. Based on some data, it looked like the client’s sweet spot for keywords may be in the 10 to 30 range for average search value. We targeted one phrase with 700 searches a month. It’s now ranking No. 12 on Google after making two sets of SEO changes on one page. Ultimately, the client may need a new page to grab a spot among the top 10 positions. Keywords with low search volumes shouldn’t be overlooked anyway. Collectively, these search queries can drive relevant traffic and leads. Think about what you’re selling, your margins, and the lifetime value of new customers. You might sell a $10,000 or even $50,000 service or product based on low-volume keyword phrases. Selecting keywords isn’t just about search volume and rankings. You also need to consider searcher intent and where the existing or new content falls within the buyer’s journey. Google has identified backlinks as a top linking factor. Stone Temple Consulting recently updated its in-depth study that details the strong correlation between backlinks and ranking. Explore your team members’ own connections. Use PR strategies and tactics to connect with notable news media. Become members of more groups that are even loosely tied to what you sell. Launch a series of surveys or industry studies. I like how Neil Patel emphasizes that Google can look at an array of metrics like how long people spend on your website compared to other websites and whether users quickly leave your website and return to Google. “If you want to beat Google, you have to shift your mindset. It’s not about understanding Google, it’s about understanding users,” Neil writes in How Digital Marketing Will Change in 2019. How will you survive SEO in 2019? Modify content already in place and be strategic as you create new content that you expect to perform on search engines. What kind of cards have you earned for the next poker game? Get a better grasp on the interplay of content and technology this April at ContentTECH Summit. Register today using code BLOG100 to save $100.